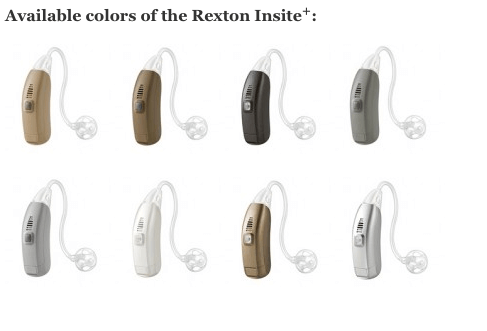 Updated November 4, 2016 – One of Rexton hearing aids more advanced hearing aids, the Insite+, is a Receiver-In-The-Canal (RIC) hearing device designed to deliver excellent sound quality to users. It allows for wireless connectivity to users’ electronic devices, allowing for enhanced hearing enjoyment with a multitude of electronics. Additionally, it is available in numerous colors, allowing users to find the perfect hearing aid for them. Focus 360°: This advanced feature allows for enhanced speech hearing in a variety of situations. It automatically picks up to the dominant speech signal even if it is to the rear or side of the user. This feature is excellent for having conversations in the car, or any situation where the hearing aid wearer cannot directly face the person talking. Blu Link: This feature allows for compatibility with the Blu RCU accessory. With Bluetooth capability, audio can be streamed directly to the user’s hearing aid. Wireless Technology: This feature allows users to make single-touch adjustments to multiple hearing devices at the same time. Program and volume changes are made much easier for those who wear binaural hearing instruments. Wireless Assistant: This feature helps to optimize the Insite+ hearing aid’s sound quality, while also helping make it easier to use. Feedback Preventer: This feature automatically eliminates feedback in the user’s hearing aid before it can be heard by the user, or anyone around them. This can help make phone conversations much more enjoyable, as it eliminates the annoying whistling that can often occur while on the phone. Sound Radiance: This feature helps to provide users with a richer, fuller sound spectrum, by enhancing the user’s hearing of high frequency sounds. This can help provide users with more enjoyment of music, sounds in nature, and voices. Sound Locator: This feature of the Insite+ hearing aid mimics the natural function of the user’s outer ear (the pinna), by helping users pinpoint the location of sounds in his or her environment. SoundSmoothing: This feature helps make sudden, impulsive sounds more pleasant to hear. The uncomfortable sounds of rustling paper or clanging dishes is substantially reduced. Multi-Channel Adaptive Directional Microphone: This feature provides enhanced speech hearing in noisy environments, especially where multiple people are speaking at once. Automatic Environment Management: This feature is constantly analyzing the user’s sound environment, and adjusting the hearing aid’s settings to provide the user with the best sound quality possible. Rechargability: Since the device is compatible with standard, or rechargeable batteries, users have the option of performing a nightly charge on their hearing aids, preparing them for the following day’s use. After 6 to 8 hours of charging, the hearing aid is ready to be used for the entire following day. This small, Bluetooth compatible device allows users to make discreet adjustments to his or her hearing aid’s volume or program settings. Additionally, it also lets users stream high-quality stereo sound from his or her television, mobile phone, MP3 player, radio, and other electronic device, directly to their hearing aid. This lets users listen to the television at a volume that they can hear, while his or her family watches at a volume comfortable for them. This accessory helps eliminate drained hearing aid batteries at inconvenient times. Each night, the user can charger his or her hearing aids, allowing for a full day’s use the following day. Additionally, the charger’s drying feature helps remove moisture from the hearing aid that can cause lasting damage. Rexton offers good services. I am a new user, thus far I find the technician very professional and helpful.